Change Auto Glass proudly offers Auto Glass Repair and Replacement services in Fremont and surrounding Bay Area cities. We have In-Shop location in Fremont with newly remodeled customers waiting area as shown in pictures below. The newly re-modeled waiting room is hooked with cable TV and drinks. 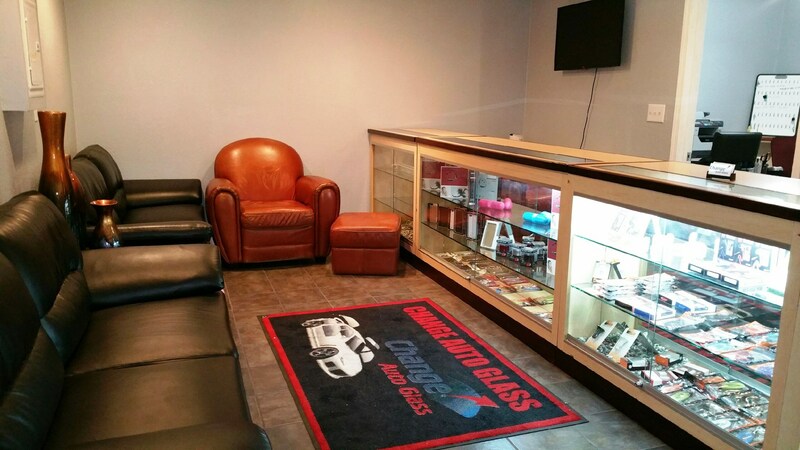 Customers can enjoy watching TV and have a drink, while waiting for their Auto Glass service. Having In-shop location for customers instead of Mobile helps us charge customer less and provide maximum satisfaction. We have both OEM (Original Equipment Manufacturer and After Market Glass). If you have insurance, just give your insurance firm our phone number 1-800-510-0873 and they will find us on their database and will forward a claim. we do all the Insurance Paperwork for you, directly bill Insurance and in most cases waive the deductibles. Give us a call for your next Auto Glass Replacement Service.